DailyMTG.com content manager Blake Rasmussen made the announcement that after a decade of yearly releases, the Duel Decks series is coming to an end. Duel Decks: Elves vs. Inventors—releasing April 6th, 2018—will mark a conclusion to the long-running series of preconstructed theme decks. Typically designed around popular characters, worlds or themes, Duel Decks offered a single-purchase product including two decks built to play against one another. With an MSRP of $19.99, the series was often seen as an outlet for some amount of reprints and casual play. 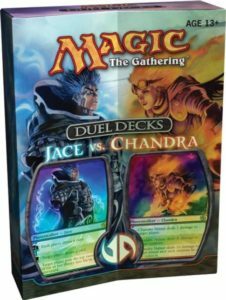 The first in the series, Duel Decks: Jace vs. Chandra, featured a respectable amount of desired reprints, including cards like Ancestral Vision, Gush and Counterspell. It also saw an exclusive variant released in Japan, featuring anime versions of Jace Beleren and Chandra Nalaar. Recent decks, however, have leaned less on reprints and more on the alternate art face cards of each deck. It comes as little surprise that Wizards might discontinue the series, as reception in recent years has been modest. While the volume of reprints has been consistently criticized as insufficient in the community, the discontinuation of Duel Decks has left some fans concerned that Wizards of the Coast is eliminating one of the few opportunities they have to reprint cards without the requirement to print the cards in Standard or Modern. Along with the cancellation of Duel Decks will come the release of a new product Wizards of the Coast is calling Challenger Decks. These preconstructed products are Standard-legal, and they are designed as way to allow new and returning players an easy purchase to participate in Friday Night Magic. Rassmussen called Challenger Decks “your on-ramp to Standard.” With an MSRP of $29.99, each Challenger Deck will include 75 cards (a 60-card deck and sideboard), a box sized to fit 75 sleeved cards, a spindown die and quick reference guide. There will be four Standard-legal decks on offer at release, and Challenger Decks appear to be a new take on the previously-available Event Decks. As for power level, Wizards of the Coast promises that the decks don’t “pull many punches.” Based in part on decks from the Pro Tour and Grand Prix tournaments, Challenger Decks are built by Wizards’ new Play Design team. Full decklists are expected in February. Wizards of the Coast staff responded to concerns on reddit, clarifying that Challenger Decks are not replacing Duel Decks, and their simultaneous announcement is “not related.” All four Challenger Decks will be released on April 6th, 2018 alongside the final Duel Decks product. Challenger Decks, like Duel Decks, will be available in English and Japanese.